Become a NAMIWalks Hero. 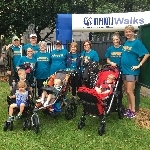 Join our team “Mere’s Miracle Team,” for the 2019 NAMIWalks event! We are walking to raise awareness of mental illness and raise funds for the important work of NAMI, the National Alliance on Mental Illness and in support of our daughter, sister, niece, cousin and friend Meredith, who suffers from schizophrenia. Please JOIN OUR TEAM and walk with us, or support our team by making a donation to a team member listed on our ROSTER. Donations on this page are fast, secure and easy. We also invite you to be a virtual team member if you cannot join us on May 4, 2019. All funds raised directly support the mission of NAMI to provide support, education, and advocacy to individuals and families right here in our community. We know first hand how difficult it is not only financially, but also emotionally for people with mental illness and their families. Our family has benefitted greatly from NAMI and their programs. Your support means a lot to me and Jim and our family, our team, and the 43.8 million Americans who experience mental illness in a given year.